Every November, people just like you head out for the annual deer hunt, a ritual that spans generations. Time has come to return to the same hardscape country you have always loved, for another season of creating lasting, wonderful memories. 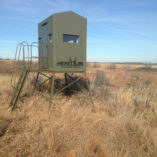 You look to your trusty deer blind again to shield you from the weather, to hide the immaturities of your outing from nature, and to create long-lasting memories of your time-honored tradition. Memories that will long outlive you and laughs that will surround your legacy. That is what hunting is about. Your future generations will tell and retell your teachings about survival and the wilderness, and how you kept the family traditions alive while trusting the toughest fiberglass deer blind to see you through the season. 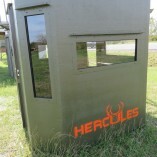 Become the hero of your own legends, with a Hercules Fiberglass Hunting Blind. 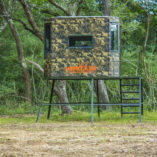 Create your next lifelong hunting memory in a Hercules Fiberglass Hunting Blind. 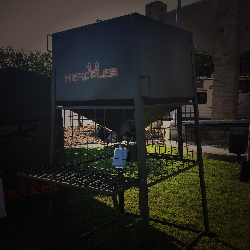 Located just a little ways outside Houston in Santa Fe, Texas, Hercules Outdoor Industries is the new leader in the hunting blind and hunting products business. Our goal is to bring our family values to the workplace every day, in order to provide your family with the best fiberglass hunting blinds in the business. Hercules fiberglass hunting blinds are developed and built by hunters just like you, with your needs in mind. Our mission is to build the toughest blinds with all the creature comforts. Fiberglass hunting blinds are truly the only way to go. You don’t have to be an expert woodsman when you go hunting in a box blind. 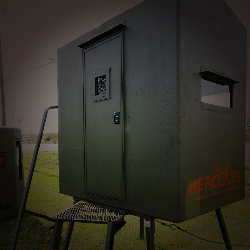 Hercules box blinds will hide you, shield your movements, and provide a restful place while waiting patiently for your next trophy kill. Texas tough, and made in America, our fiberglass hunting blinds will last you a lifetime. 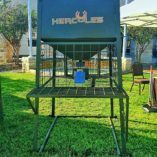 Hercules Outdoor Industries has expanded our product line to include big game feeders and deer attractants. We worked tirelessly to assure that our new products are top-of-the-line, and did extensive field research and testing to ensure the quality. All of our products are 100% Made in America, and our new feeders and attractants are no different. Hercules feeders are the feeder of choice for McMillan Outfitting. These professional outdoorsmen make their living hunting in the field, and they demand the toughest, most reliable products. We delivered for them, and we deliver for you! Our Super Deer Attractants are all natural and full of nutrients that growing and grown whitetails need. 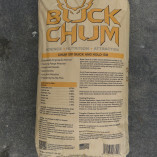 Our attractants line has two variations, Buck Chum and Ghost Powder. 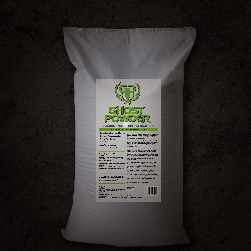 We have tested and retested the efficacy of our attractants, and are proud to say that both attractants have both long range and long term attraction, as well as a light aroma and flavor combinations that deer simply cannot resist. We are excited to launch our new product line of feeders and deer attractants, for all of your off-season game needs.